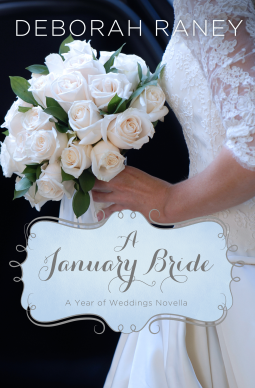 Part of A Year of Wedding Novella series: In A January Bride by Deborah Raney, what will happen when novelist Madeleine Houser’s “pen pal” friendship with a lonely widower takes an unexpected turn? Who can work in a house that's overrun by contractors and carpenters? Not Madeleine Houser, a successful novelist who gladly accepts the help of her octogenarian friend, Ginny, to arrange for a temporary office in the charming bed and breakfast owned by Ginny's friend, Arthur. Maddie's never met the innkeeper - but a friendship grows between them as Maddie and Arthur leave messages for each other each day. To Maddie's alternate delight and chagrin, she seems to be falling for the inn's owner - a man who's likely many years her senior - and who she's never even met. Unlike December Bride, January Bride is done with a stronger flavor of faith in it. It's a cute story about a writer and an inn keeper widower who mistakenly believed something about the other, they start to communicate through letters and slowly begin to feel great regard for the other even though they have never met. I laughed when I figured out what was happening; they certainly had their own time frame and they truly had made some funny assumptions about each other. I loved that the characters were both book lovers (one being an author, the other a professor in English). It was funny to read about an author struggling to get the story written and how she kept finding little pieces of Arthur and using them in the book she was writing. They several near meetings and each one made you want to see if they would figure out who the other was. I loved their friend who kept them in the dark and aided in the meeting of minds before they could even begin to find reasons why it couldn't work. I totally get Arthur's hesitation and clearly he needed to feel like he was doing the right thing and not just being a lonely man grasping the first thing to make him feel. Maddie was an amazing and straight forward woman, who knew what she wanted but didn't want to be jerked around and she put her boundaries out there and I love her even more for it. Make sure to RSVP to the other Weddings taking place this year. Click the link to get your invitation. I enjoyed reading the story, even with it's strong Christian flavor, it might be a little strong for those who aren't Christian but will be the right amount for those looking for a good clean love story with faith involved. Enjoy the latest wedding my loves and see you at the next one! !